SANTEE (2-15-18) – Just before the regular season finale between the visiting El Capitan Vaqueros and Santana Sultans both squads did quite a remarkable thing. Both teams and head coaches and officials all stood side by side in a straight line at midfield. 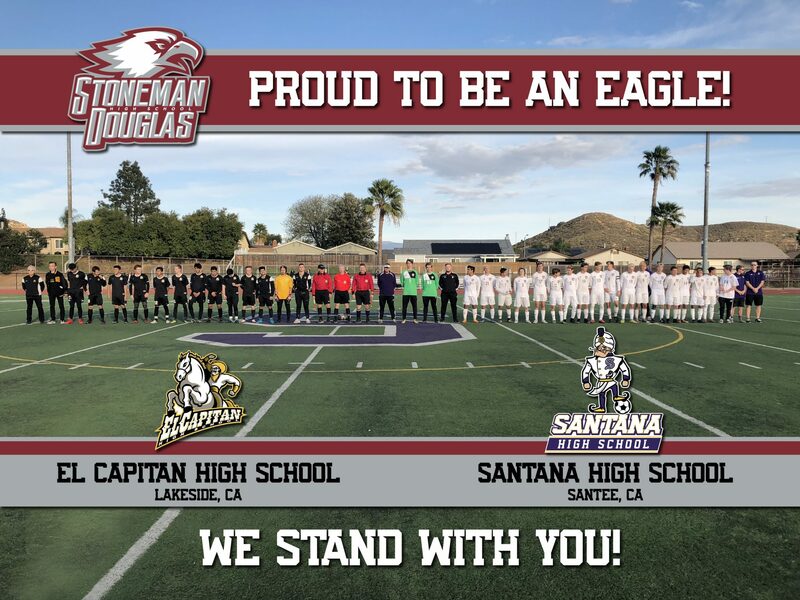 This was done in remembrance of the victims of the heinous school shooting that took place in Florida at Stoneman Douglas High School who are home of the Eagles. It was quite a scene for the moment of silence as you could hear a pin drop. After the remarkable scene of the moment of silence each team took to the field. However the El Capitan Vaqueros who really had nothing to lose put on a show of their best half of soccer as they shut down the mighty Sultans offense and held them scoreless in the first half. So with the score 0-0 both teams went to the intermission. However, things changed in the second half as a light bulb turned on for Santana as Omar Nuristani was able to put the Sultans up 1-0 with a goal in the early minutes of the second half. Santana would score again when Lane Dukes received a beautiful ball from Nuristani for the assist and would smash in the back of the net to go up 2-0. Another goal from Nuristani later on would make it 3-0. Despite leading by a nice margin the Sultans were not done as Zane Moore took another beautiful ball off a cross from Nathan Hughes and found the back of the net to extend the lead 4-0. Later on, the icing on the cake came when Nuristani was able to get past the defenders for a one on one wide open deal and snake it past the Vaqueros goalkeeper for the hat trick. With his three goals on the day, Nuristani now has 26 on the season which leads the District and also is in the top of the County if not leading. Dukes was able to garner his 14th while Moore notched his 2nd of the season and Hughes with his 7th assist. With the win, the Sultans clinch a tri-championship with both Valhalla and Monte Vista. The championship is the 9th in school history and the 4th under head coach Luke Phillips who took over the program in the 2007-08 season. Previously the Santana Varsity program was under Danny Martinez who guided the Sultans to 5 league championships. Santana also boosts their momentum heading into the CIF Division III Playoffs which will be announced on Saturday morning. Currently, the Sultans are in the 7th spot in Division III. After the game, the Sultans celebrated and then celebrated the seven seniors which included Ben Sampson, Zack Hirt, Tim Caravero, Garrett DeRosiers, Zane Moore, Kyler McPhillips and Daniel Dean.